1. Body shape: three body segments. 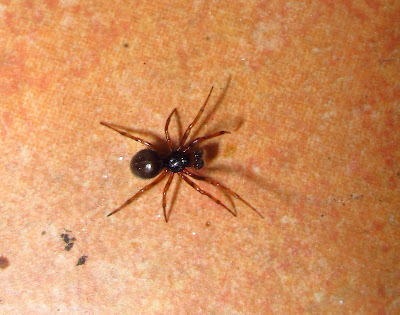 Spiders have two body segments so ant-mimics must evoke the three body segments of an ant (head, thorax, abdomen) The large palps of male Steatoda bipunctata, carried raised and together, appear to make the role of an 'ant head'. Check! 2. Three pairs of legs and one pair of antennae. 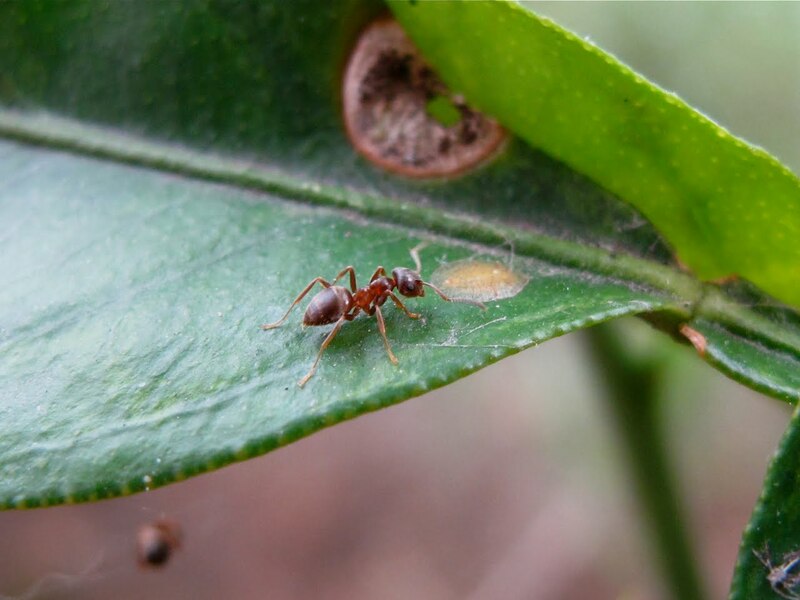 I need to carry more observations on live individuals to assess how the front legs are carried, as ant mimics carry them forward and often raised. 3. Petiole or 'waist' of the ant. 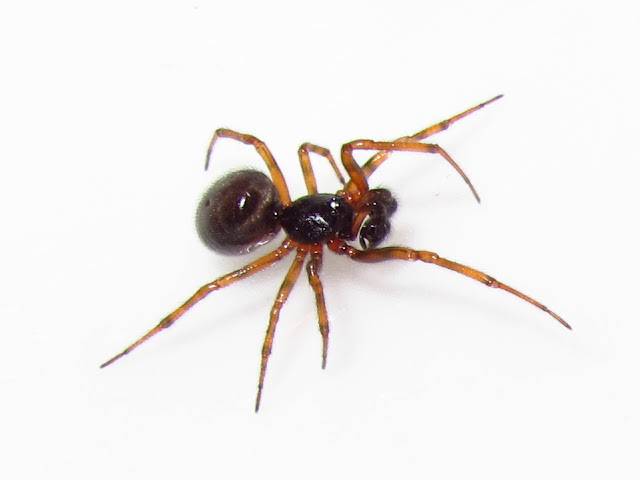 My spider has a strong constriction at the end of the cephalothorax reminiscent of the 'waist' between the thorax and the abdomen of the ant. Check! 4. Mandibles. Pointed palps, but not an obvious feafure of Lasius niger. 5. Pair of compound eyes. No clearly mimicked, but also not a very distinctive feature of L. niger. 6. Sting. Not normally visible in Lasius niger. 7. Thin body and legs. Check! 8. Shiny surface. Very shiny, waxy looking. Check! 9. Segmented abdomen. Abdomen with bands that reflect light as the tergites in an ant abdomen, with a similar pubescence. Check! Not bad, a clear 5 out of 9 ant-mimic features clearly by this species, and I must add that something missing from the list are the general size and colour, which in this case also fit the garden ant. That the male does resemble an ant more than the female could be explained by the fact that he is likely to be exposed to predation while he moves in search of females - who sit on their webs and would be unlikely to gain much from resembling an ant. I just found one of these trying to build a web between the sink and the faucet handle in the kitchen. I thought at first that it WAS an ant, as it's HUGE compared to all but one of the other spiders of this species that I've found in my house in the last year or so. (we're apparently a good breeding place for the False Widow spiders, as they keep popping up everywhere). I have him safely in a jar right next to my computer as we speak. I'm not sure where I'm going to relocate him to, since winter is rapidly approaching. Can you direct me to any other websites with more information on these nifty little nippers?